On January 21, 1977, an unknown documentary titled “Pumping Iron” was released to a limited number of theaters in the United States. The film chronicled a group of bodybuilders who competed in the 1975 IFBB Mr. Universe and Mr. Olympia competition in Pretoria, South Africa. At the time of it’s release, the sport of bodybuilding was clouded in mistruths and old wives tales. As Charles Gaines, the author of the book Pumping Iron, said, it was in the same category as midget wrestling and roller derby. 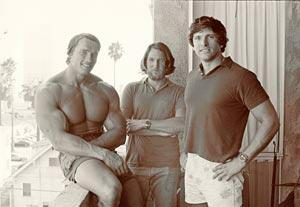 Director George Butler, who had taken the pictures for the book Pumping Iron (1974), decided to make a documentary film about bodybuilding after the initial success of the book and, more importantly, after meeting Arnold Schwarzenegger for the first time. 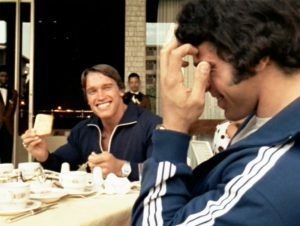 Butler and Gaines had met Arnold when they were on assignment to write an article on bodybuilding for Oui Magazine at the 1972 IFBB Mr. America contest in Brooklyn, New York. Charles Gaines said both he and Butler realized that Arnold was a future star only moments after meeting him. His remarkable charisma and magnetic personality had them convinced that this guy would be in the movies. Over breakfast the next morning, Arnold revealed his “Master Plan” to the enterprising journalists. “I will win all the major titles in bodybuilding, make big money in real estate and then become the biggest movie star in the world”, the unknown Austrian Oak confided to Gaines and Butler. Along the way, the would marry an “American princess” and everyone in the world would know his name. Gaines and Butler traveled to Baghdad, Iraq that fall to record the events taking place at the 1972 IFBB Mr. Universe. They got to know the American contestants Mike Katz and Ed Corney and took photos and did interviews as part of a new book deal they had secured with publisher Simon and Schuster. The next summer, they spent time in Venice, California, getting to know the bodybuilders who were training for the big competitions that September. Arnold Schwarzenegger and Franco Columbu were training for the Mr. Olympia while Ken Waller, Mike Katz, Bill Grant and others were prepping for the Mr. America and Mr. World contests. Gaines and Butler traveled to New York to cover the show and the eventual drama that ensued. In 1974, the book Pumping Iron was released to very positive feedback. Despite the public’s lack of knowledge about bodybuilding, Pumping Iron was a resounding success based on the fascinating photographs from Butler and the superb writing of Gaines. The book had broken new ground by introducing bodybuilding to a worldwide audience, bringing with it a sense of dignity and class that had never been considered before when it came to the widely misunderstood sport. The following year was a ground breaking year for bodybuilding. Charles Gaines first book Stay Hungry was being adapted into a major motion picture by director Bob Rafelson. To play the role of bodybuilder Joe Santo in the movie, Gaines recommended Arnold Schwarzenegger for the role. After some serious doubts by the director regarding this unknown bodybuilder with the strong Austrian accent and no acting experience, Arnold was finally awarded the role as long as he agreed to go through six weeks of intense acting classes with Jack Nicholson’s acting coach. 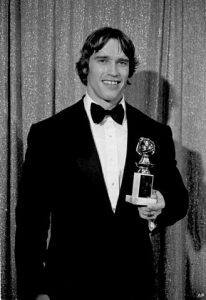 When the movie was released one year later, Arnold won the Golden Globe award for Best Acting Debut. To this day, it remains one of Schwarzenegger’s best performances, a role that required Arnold to be charming, reflective and thoughtful. One concern Rafelson had with hiring Arnold for the movie was his immense size. At 240 pounds, the director feared that Arnold would dwarf tiny co-star Sally Field on screen. Rafelson asked him to lose thirty pounds for the movie and Arnold happily complied. The day before the first day of shooting, Arnold and Rafelson worked out together and Arnold stepped on the scale after the workout weighing only 209 pounds. 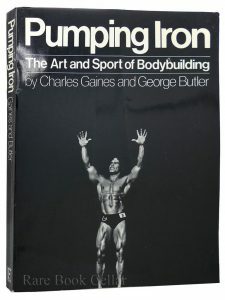 George Butler visited Arnold on the set of “Stay Hungry” and asked him to appear in the movie “Pumping Iron”. Butler was planning to start filming that summer in preparation for the 1975 Mr. Universe and Mr. Olympia in South Africa in November. Arnold at first refused the offer, insisting he was finished with bodybuilding competition and was going to focus on his acting career. Fortunately, Arnold changed his mind and decided to train for three months to prepare for the 1975 Mr. Olympia contest in order to appear in the movie. The camera crews were on hand to record his transformation as Arnold regained his Mr. Olympia physique just in time for the contest twelve weeks later. The film “Pumping Iron” received critical praise from the film critics who were pleasantly surprised at how charming and absorbing the movie was. By focusing on the personalities of the bodybuilders in the film instead of their physiques, Butler had made an engaging and entertaining movie that appealed to everyone, despite what they may have thought about bodybuilding before seeing the movie. From the cocky and charming personality of Schwarzenegger to the brooding and serious Lou Ferrigno to the sweet but self conscious Mike Katz, “Pumping Iron” introduced the world to a group of individuals who just happened to compete in a sport in which they developed outrageously muscular physiques. We got to know them as unique personalities who had the same fears, doubts and insecurities as everyone else. The success of the film had a lot to do with Arnold Schwarzenegger. Basically playing himself, the confident king of bodybuilding was engaging, funny and always entertaining. We couldn’t keep our eyes off of Arnold when watching the movie. Gaines and Butler were right, Arnold was a future star that the world didn’t know about yet. “Pumping Iron” was the perfect vehicle to propel Arnold into the spotlight. Looking back at the film forty years later, it is still a compelling documentary about a unique sport involving a wide variety of personalities. The camaraderie and fun shared by the group of bodybuilders, most of whom worked out at the original Gold’s Gym in Venice, California, is intoxicating. You get the feeling of wanting to go to the gym and start working out yourself after seeing the movie. “Pumping Iron” made bodybuilding popular by introducing a little known and widely misunderstood sport as a fun and joyful experience. It is the classic bodybuilding film, a movie that many bodybuilders still quote the classic lines from even today. Thanks to the heroic efforts of George Butler and Charles Gaines, the book and movie “Pumping Iron” helped the sport of bodybuilding gain respect and popularity among the masses and began the physical fitness movement in this country and around the world that is so much apparent today. Athletes are no longer restricted from working out with weights in the fear that they will become “muscle bound”, movie stars and models all follow a bodybuilding type regimen to change the look of their physiques, the American public talks about getting “ripped” and “buff” and commonly use bodybuilding lexicon that was foreign to them before “Pumping Iron” made it’s debut in the late 1970’s. “Pumping Iron” changed the world and those of us who love bodybuilding will always be grateful for that.